The SNP government have sought to distance themselves from suggestions that a referendum on independence has been pencilled in for Saturday October 18th 2014, following the revelation in the first edition of The Sun on Sunday over the weekend. Seeking to distance ministers from the report, a spokesperson for the first minister is today quoted as saying that whilst the date is a “possibility” a final decision “remains to be taken”, with a pledge that the Scottish parliament will be told first as soon as the consultation on a referendum has closed. 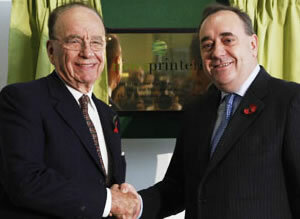 The apparent leaking of a date to Rupert Murdoch’s new paper has however once again raised questions over relations between the SNP, and Alex Salmond in particular, with the media tycoon, at exactly the same time that deputy assistant commissioner Sue Akers yesterday told the Leveson inquiry that a “culture of illegal payments” to sources had developed at the paper. It comes after a string of allegations over links between the Scottish government and Murdoch, with Scottish Labour last year having published 25 questions that the SNP needed to answer over the ties. “In Alex Salmond’s rush to cosy up to Rupert Murdoch, he has chosen a date which threatens to disenfranchise a huge number of Scots. The SNP’s rationale for a Saturday is to boost turnout, but this date would result in the opposite. “Coming just as Scotland’s second biggest company warns of the risk to investment, I do not understand the need for a three year delay. “There is nothing that prevents the SNP holding this referendum now. We can’t afford to wait years to make this decision. Donald Dewar held a referendum within 134 days of coming to power, but it is going to take Alex Salmond seven and a half years. “Now we seem to know Alex Salmond’s preferred date for his independence referendum – 18 October, 2014. It happens to be a Saturday, the rationale being that it would make it easier for people to vote than if the poll was held on a traditional Thursday. “There is nothing wrong with that. As this is such a momentous decision that Scots are being asked to take, it is only right that as many people as possible should be able to take part. “Slightly odd is the choice of channel for dispensing this information – a leak to the new Sunday version of The Sun newspaper. “Of course, since it has been unofficially leaked rather than officially announced, it makes it easier for the first minister to change the chosen date, should that prove necessary. “Rather more interestingly than that, handing out goodies and titbits to people whom Mr Salmond wishes to woo is a well-tried tactic from the SNP repertoire of political techniques. “Rupert Murdoch, the proprietor of The Sun and from whom all decisions about political positioning flow, could be described as a floating voter. “The Sun has backed the SNP in the past, and sometimes it has not. And in recent months, Mr Murdoch has indicated his admiration for Mr Salmond’s political skills and some sympathy for the idea Scotland should be independent. So it is easy to see why Mr Salmond would want to curry favour with him. “But the idea that this will pay huge dividends for the SNP is misleading. Meanwhile, the campaign to save the union finally seems to be taking shape, as the Scotsman today reports that Scottish Labour, Lib Dems and Conservatives have held discussions about forming a cross party campaign against independence. “Gordon Brown increased Labour’s share of the vote in Scotland and is still popular. Gordon Brown is potentially more popular than Alex Salmond and he would make a key difference in the campaign. “He’s one of the few prime ministers in recent history to have left office with his credibility enhanced because of the dignified way he left Downing Street during his last day there. “The humility he showed means that a lot of people view him in a positive light and that’s why I hope he’s involved in the campaign. Brown’s an imbecile – arguably the worst Prime Minister in modern times. However, if he can drum up extra votes for the Unionist position, he’s worth working with. I believe that the first prize for idiocy should go to Thatcher, the second to Major and the third to Heath. You probably qualify for the worst personal description ever given. Have a good day dipstick. Bless. Lovely that you have to resort to insults. Although I am with you on Heath. He’s a close second, IMO. Less than 1/4 of this article was on “the dream team”, which then turns out to be Ms. Lamonts pipedream: “We have to get people like…”. So nobody actually signed up then. The rest is just a “lets bash the SNP for all the media tricks we committed in the New Labour period” exercise. The sun has backed Labour and the Tories in the past so I doubt anyone at SNP HQ takes their commitment seriously, but it’s nice to be warned: best intentions and all that. Rather than scraping together some pro-union ‘dream team’, why don’t the London based parties offer the Scots what they actually want – far more powers and responsibility for the Scottish Government ? Hard to imagine how Brown and darling could be a’Dream Team’ – the current mess is not all their fault, but a fair bit of it is. If they ‘front’ the refeerndum campaign along with Miliband and Cameron, then the campaign will be in trouble from day 0ne. All you need to know about the SNP. I can’t think of ONE of the current Labour flock of seagulls who could drum up ONE extra vote for the union. If this is your hope, you’re in for a BIG disappointment! Dream Team? Darling has been conspicuous by his absence recently, and although he and Brown might like to say that they ‘saved the economy’ , they really just saved a bunch of wealthy shareholders in various international banks. Who else could be in the ‘dream team’…Cameron? Osborne? Clegg? If Salmond is to be defeated the ‘No’ campaign will have to find someone who can over-match him intellectually, especially in practical economics. Clearly it can’t be any of the above, nor Ed Balls or Menzies Campbell, so who? Johann Lamont?